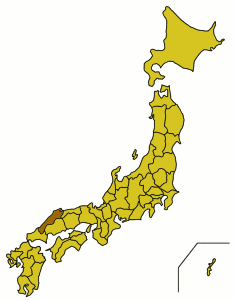 Shimane prefecture (島根県 Shimane-ken ; ,) is in the western Chugoku region of the main Japanese island Honshu. It is the 2nd least populous prefecture in Japan. Shimane prefecture, together with Tottori prefecture is known as the Sanin region, meaning "the shady side of the mountains". There is a mountain range separating these two prefectures from Hiroshima and Okayama, which means that the weather here is drastically wetter than further to the south. Matsue[松江] — The prefectural capital, Matsue has an original castle (most in Japan are modern remakes/rebuilds). Izumo[出雲] — Site of Izumo Taisha, one of Japan's most famous shrines. It's fomous for "Izumo Soba". Also known as "the town of Japanese Myth". Hamada[浜田] — Fishing port and recreation area. Tsuwano[津和野] — Referred to as "Little Kyoto," home to a steam train and the birthplace of Mori Ogai. Masuda[益田] — The westernmost city in Shimane and long-time home of Sesshu, one of the most famous artists in Japanese history. Gotsu[江津] — A small industrial city between Hamada and Oda. Oda [大田] — A reasonably sized city close to Iwami Ginzan and Mt. Sanbe. Yasugi — Site of the Adachi Art Museum, Yasugi borders Yonago in Tottori Prefecture. On a clear day you can spot the snow-capped Mt. Daisen up north. Ohnan — Small mountain town with great skiing and friendly people. Shimane has airports in Izumo (IZO), the Oki Islands (OKI), and Masuda (IWJ). When travelling to Matsue then nearby Yonago Airport is also an option. Shimane is on the Japan Rail San'in Main Line, which runs along western Honshu's sea coast between Kyoto and Shimonoseki. Japan Rail's "Sunrise Izumo" night train runs between Tokyo, Matsue and Izumo. Prices vary depending on the accomodation booked, which range from simple berths to private cabins. The "Super Yakumo" express train connects Matsue and Izumo to Okayama. The "Super Okii" JR train line originating in Shin-Yamaguchi stops at a number of cities and town in Shimane prefecture. Overnight ferries depart twice a week from Sakaiminato DBS Ferry Terminal to Donghae, Korea and then onwards to Vladivostok, Russia a day later. To get to Sakaiminato DBS Ferry Terminal from Matsue take the train from Matsue Station to Sakaiminato station (transfer in Yonago). There are free shuttle buses to the terminal on Friday and Saturday. The best way to get around Shimane is to drive. Most towns and cities, especially those on the coast, can also reached by train. Buses go pretty much everywhere, but some places may only have a few buses a day. Matsue Castle (Matsue) Beautiful black castle; One of Japan's few remaining original castles. There are many ski resorts in the prefecture. Most will blow snow when it hasn't fallen, giving a reliable season from late November until late March. Mizuho Highland is the biggest (10 slopes, 5km longest run) and probably best (the only half-pipe in the region) resort. The Yabusame (horse-back archery) festivals of Shimane are quite famous, especially that of Tsuwano, which holds the oldest Yabusame range in all of Japan (some 1000+ years old). They usually are held in early April. If one is particularly lucky, the festival will coincide with the cherry blossoms blooming, for the consummate Japanese cultural experience. During the year there are numerous festivals. Many towns and cities have a fireworks show in August. Seven Delicacies of Lake Shinji To get a taste of Matsue and the area around Lake Shinji, you should try to sample the famous seven delicacies: Shijimi clams, icefish, eel, sea bass, among others. Akaten A local fish specialty product of Hamada. The name 'Akaten' means red heaven. For cheap accommodations, the prefecture has a number of youth hostels.